Car Chargers provide charging voltage to Thuraya satellite phone's battery through the DC jack port of the phone in vehicle environments. It is suitable for 12V and 24V vehicle DC-power supplies. Also called a cigarette lighter charger, this accessory supplies power to phone during call in progress, standby and power down. 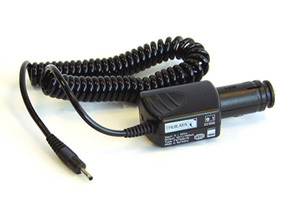 Car chargers are often used to connect satellite phones to many types of solar charging panels. NOTE: This product is not compatible with SO-2510 and SG-2520 phones.